Toulouse, March 25th, 2009 – Boogie Bug and Bacatá (Pan European Master Distributor) are proud to announce the New Blade Series fans. 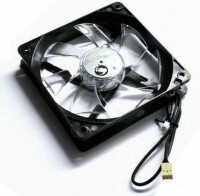 Two years after introducing The Blade Series Fans, Boogie Bug today introduced the New Blade Series Fan. Specifically developed to achieve a good balance of airflow, pressure, noise and price range level, Blade Series Fans is designed for silent enthusiast users.